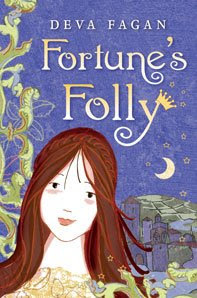 If you are looking for a lovely new book to give a ten year old girl (or the right sort of boy) I am happy to recommend Fortune's Folly, by Deva Fagan (coming April 14, from Henry Holt, 257 pages in ARC form). Once Fortunata's father made the most beautiful shoes in all the land. But when her mother died, the fairies that he believed helped him in his work left, and now the things he makes are laughable. Rather than stay in their home city, becoming poorer and poorer as the market for ridiculous shoes drys up around them, Fortunata and her father hit the road. Their path leads them to a group of travelling performers, and almost before she knows what's happened to her, Fortunata finds herself selling fake fortunes....and being rather good at it. To good, in fact. The truly unpleasant leader of the troupe is so impressed with her skills that he traps her into telling the fortune of Prince Leonarto himself. The words come tumbling out of her mouth, telling of a witch, a white horse, a wondrous sword, a princess in danger, and the most beautiful pair of shoes ever made. If her "prophesy" comes true, Leonarto will be able to assume the kingship. If it is proven false, Fortuna's father will be killed. This is a delightful story, told with charm and verve. It's not a fairy tale retelling, exactly, although there are plenty of allusions to well-know stories, and there's no overt magic in it, although the reader is left wondering if Fortunata really can see the future...but it will make fans of fairy tale retellings feel right at home. I liked Fortunata a lot, and I was happy to cheer her onward as she persevered in her quest (Leonarto never quite became real to me, although he is rather sweet). "A pale blue, like cornflowers, but deeper and more pure. Silver braiding edged each graceful curve; even the laces ended in delicate silver tassels. They were the most lovely pair of shoes I had ever seen." These are officially my favorite pair of fictional shoes, beating out Maria Merryweather's boots in The Little White Horse. Amazon says this is a young adult book, but Amazon is wrong- it's for ages ten and up. Really. The back of the book says so. Here's another review at Kidliterate, and you can read the first chapter for yourself at Deva Fagan's website.